Are Bed Bugs only in Beds? Bed bugs often start breeding and are located in the box-spring on bed or in bedroom. However due to the biology and mating habits of bed bugs they populate very quickly and will branch out anywhere and everywhere after a period of time. This occurs in part because of the biology and mating habits of the bugs. Male bed bugs want to mate after every feeding and inseminate females by “traumatic insemination” (puncturing the abdomen of the females) to inject sperm. This causes the female bed bugs to literally run for their lives to new areas to hide. Books, dresser drawers, behind pictures, under carpet edges anywhere they can find a crevice. So even if you cannot find any bed bugs you can still be infested. 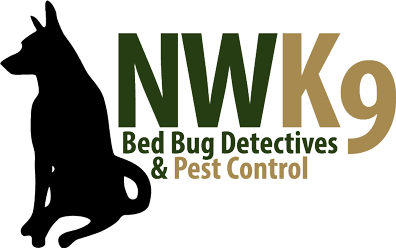 Contact Seattle’s Bed Bug Specialists at Northwest K9 Bed Bug Detectives we use our certified bed bug dog “Magic” to sniff out the bugs in your home.